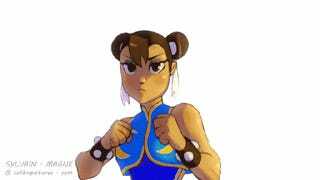 This isn't the Chun-Li I remember! But it doesn't matter much because look how awesome that animation is. I can watch her loop around for that hit too many times than is normal. Or at least until I fall over from dizziness. That, or someone yells at me to go back to work and stop being weird. I'll only promise to deliver on one of those things, though.